You are browsing the archive for seachtain. A few weeks back, I mentioned my intention to take part in the Scór national quiz. As a warm up, I was invited by the same organiser, Hugh, to take part in an Irish language equivalent. This Trath na gCeist was organised by the Roscommon County GAA Board and took place in its main headquarters on Wednesday night last. Tables representing 11 Roscommon GAA clubs took part. 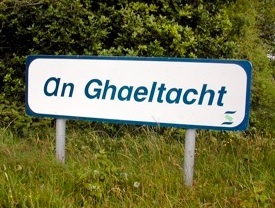 Format-wise, it was just a table quiz in which the questions were called out ‘as Gaeilge’. My Irish isn’t half as bad as I thought it was. Throughout the course of the night, only one question completely stumped me and, in that case, it was only one word that caused the problem. My knowledge of Ireland isn’t deep enough. This is a funny one, given Dave’s article from before Christmas, but, as you’ll see from the questions below, this quiz featured 80 questions that were all about Ireland and NOTHING ELSE. Our team, Éire Óg, featured myself, Hugh and two other guys, Seamus and Justin. It was a very entertaining group to be part of. However, we didn’t translate this good team dynamic into a podium finish. This was a shame as there were trophies on offer for the first three teams. Actual trophies! Our 62/80 was a good enough score – good enough, in fact, for fifth. It was nowhere near the top three though, who finished on 69, 70 and 71 points respectively. They now go on to represent Roscommon in the Connacht round of competition. AND they get those trophies!